Located at Sooka Sentral (beside KL Sentral), me and fellow Seisyun have been influenced by Aira how beautiful and delicious those Mocha is! Out of sudden, she dated me for lunch, and I get to taste their food, the first among Seisyun. Super packed during office hour's lunch time. Maybe it's that delicious eh? Dined ala Al-Fresco style that day. Didn't knew they do coffee art even though it's a cup of Iced Mocha. Most café don't do art on iced coffee because of the uneven surface of ice cubes and so. I was quite happy with my cup of drink so beautifully crafted. Not to cheesy nor creamy, but I would like it to be more salty as the consumption goes on, the taste become more and more bland. Other than that, this dish is quite decent, strong hint of herbs and spices too. 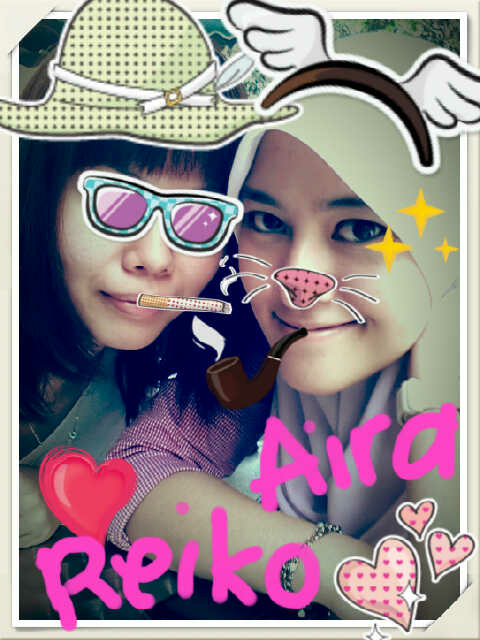 Fun and enjoyable lunch time with Aira. Come, let's do it again! Haha. Selca using Aira's Samsung S3! She covered my face with all these purikura tools because I look ugly without make-up is it?